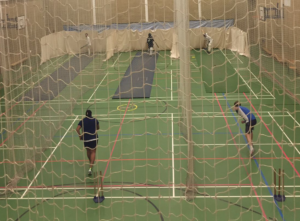 This year we’ve seen our indoor nets move to Wimbledon College on Edge Hill. With high quality facilities on offer to get rid of those off-season cobwebs we’re looking in good shape ahead of the 2018 season. There have been lots of positives with the club making good strides forward while attendances have increased drastically from last year in spite of the snow and we have plenty of new faces to show. Training takes place every Thursday from 19.30 until 21.00 at Wimbledon College secondary school.